Announcing a New NRA Competitive Shooting Publication! The National Matches: 1903-2003 The First 100 Years… Full of incredible characters, amazing athletic achievements, cutting-edge firearms technology, and, most of all, pure inspiration, The National Matches: 1903-2003 The First 100 Years… is an epic book loaded with National Match facts, notable shooter histories, and more. Newly available for Winter 2010, prepare for a literary thrill ride through the annals of National Matches history! The volume is a must have for every competitive shooting enthusiast. 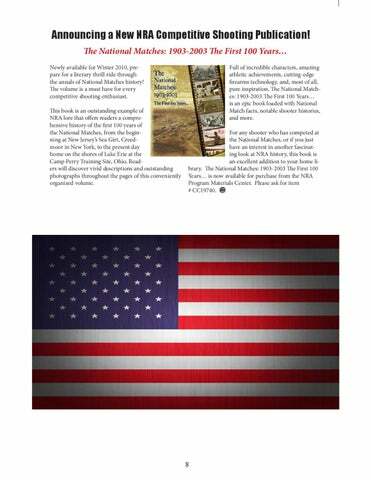 This book is an outstanding example of NRA lore that offers readers a comprehensive history of the first 100 years of the National Matches, from the beginning at New Jersey’s Sea Girt, Creedmoor in New York, to the present day home on the shores of Lake Erie at the Camp Perry Training Site, Ohio. Readers will discover vivid descriptions and outstanding photographs throughout the pages of this conveniently organized volume. For any shooter who has competed at the National Matches, or if you just have an interest in another fascinating look at NRA history, this book is an excellent addition to your home library. The National Matches: 1903-2003 The First 100 Years… is now available for purchase from the NRA Program Materials Center. Please ask for item # CC19740.